On 3rd April „Stroitel“ Newspaper – the official journal of the Bulgarian Construction Chamber, celebrated its tenth birth day with a cocktail at „Sofia Hotel Balkan“. Together with the team of the newspaper, the anniversary was celebrated by more than 200 guests, among which were the Management of the Bulgarian Construction Chamber (BCC), chairpersons of the RO of BCC, colleagues, partners and advertisers, representatives of the central and local authorities, of employers and of branch organisations, of trade unions and of the scientific circles. Official guests at the event on the occasion of the jubilee were the Deputy Minister of Regional Development and Public Works Eng. Valentin Yovev, the Deputy Minister of Economy Aleksander Manolev, the Deputy Minister of Agriculture, Food and Forestry Dr. Lozana Vassileva, Georgi Terziisky – Chairman of the MB of Road Infrastructure Agency (RIA), the former Minister of Regional Development and Public Works and of the Bulgarian Presidency of the Council of the EU Lilyana Pavlova, etc. BCC was represented by the Chairman of the MB Eng. Iliyan Terziev, the Deputy Chairmen of the MB Vladimir Zhitenski, Eng. Hristo Dimitrov, who is also a Chairman of the RO of BCC – Varna, and Eng. Nikolay Nikolov – Chairman of the RO of BCC – Burgas, the Honorary Chairmen of the Chamber Eng. Simeon Peshov and Eng. Svetoslav Glosov, the Executive Director of BCC Eng. Miroslav Maznev, Assoc. Prof. Dr. Eng. Georgi Linkov, Chairman of the Committee for keeping, maintenance and use of the CPRB, Valentin Nikolov, Chairman of the Control Council (CC) of BCC, Eng. Rozeta Marinova – Member of the MB of BCC and Chairperson of the Committee on Professional Ethics, Dr. Eng. Vladimir Vutov, member of CC of BCC, members of the MB of the Chamber Ruen Panchev, Zhivko Angelov, Eng. Dimitar Zhivkov, Nikolina Filipova, Eng. Todor Andonov, Eng. Nikolay Chomakovski, Lyubomir Peinovski, who is also a member of the MB of the Confederation of Employers and Industrialists in Bulgaria, KRIB. Among the guests were also the chairmen of BCC Sections – Eng. Stefan Totev, „High-rise construction“, Eng. Valentin Zarev, „Design and Construction Supervision“, Evgeni Borisov, „Metal structures“, as well as Eng. Nikolay Stankov – former Chairman of the MB of BCC, currently advisor to the cabinet of the Minister of Regional Development and Public works, Eng. Ivan Boykov, former Executive Director of BCC and ex-member of the BD of „Stroitel Newspaper“ EAD, Nikolay Takov, former Chairman of the Committee on Professional Ethics within BCC. The birthday party of „Stroitel“ Newspaper was honored also by Iskren Veselinov, Chairman of the Parliamentary Committee on Regional Policy and Local Self-Government, Halil Letifov, Chairman of the Parliamentary Committee on Transport, Information Technology and Communications, Eng. Galina Vassileva – Head of the Managing Authority of Operational Programme „Transport and Transport Infrastructure 2014 – 2020“, Prof. Dr. Eng. Stoyan Bratoev – Executive Director of „Metropoliten“ EAD, Tsvetan Enchev, Accredited assistant to the Chair of the Committee on Regional Development to the European Parliament Iskra Mihaylova, Assoc. Prof. Dr. Anna Djumalieva, Chair of the Commission for Protection against Discrimination, Nikoleta Marokindzhieva, Parliamentary Secretary to the Counter Corruption and Forfeiture of Unlawfully Acquired Assets Commission, Natasha Tseneva, Head of „Infrastructure, aquatory and property” Directorate under the State Enterprise Bulgarian Ports Infrastructure Company, Eng. Ioanis Parteniotis – Vice president of CL Podkrepa, Silvia Geogieva – Executive Director of the National Association of the municipalities in the Republic of Bulgaria, Pepa Mollova, Chair of the MB of the National Trust Eco Fund, Ivana Paseva from Sofia Municipality „Culture“ Directorate, Prof. Dr. of Architecture Architect Borislav Borisov, Rector of the University of Structural Engineering and Architecture „Lyuben Karavelov”, Prof. Dr. Eng. Ivan Markov – Rector of the University of Architecture, Civil Engineering and Geodesy (UACEG), the Chairman of the MB of the Chamber of Engineers in Investment Design Dr. Eng. Ivan Karaleev, Stefan Chaikov, Chairman of the MB of the Road safety Bulgarian Branch Association (BBARS), Prof. Dr. Rumen Milanov, member of MB of the Road safety Bulgarian Branch Association, Georgi Todorov, member of the MB of the BBARS, Attorney-at-law Tsveta Markova, Notary Kamen Kamenov, Irena Perfanova, Deputy Chairperson of the National Real Estate Association, Irina Yordanova, KRIB, Acad. Yachko Ivanov, Chair of the Bulgarian Scientific and technical Union of Civil Engineering, Prof. D-r Eng. Dobrin Denev, former rector of UACEG, Member of the Committee for keeping, maintenance and use of the CPRB, Arch. Veselin Kolev, Chairman of the Sports technical committee under the BCFL. The top singer Vasil Petrov and his art manager Margarita Tosheva brought an artistic touch to the party. Guests had arrived specially for the party of the edition of the Chamber from the Regional representations all over the country. Among them were Eng. Tanya Kamenova, Chairperson of the RO of BCC – Pernik, Eng. Danka Kirilova, Chairperson of the RO of BCC – Montana, Eng. 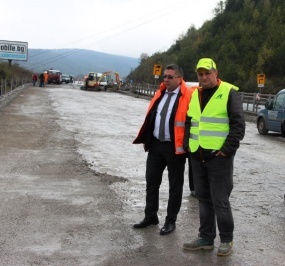 Lyubomir Sherbetov, Chairperson of the RO of BCC – Veliko Tarnovo, Bogomil Petkov, Chairperson of the RO of BCC – Gabrovo, Vladimir Kehayov, Chairperson of the RO of BCC – Smolyan, Eng. Sevdalin Petrov, Chairperson of the RO of BCC – Ruse, Eng. Svetoslav Borisov, Chairperson of the RO of BCC – Kyustendil, Petar Baykushev, Chairperson of the RO of BCC – Blagoevgrad, Krassimir Milushev, deputy Chairperson of the RO of BCC – Sofia. The National Club of Veteran-Builders was represented at highest level by its Chairman Eng. Todor Topalski and Eng. Victor Sharkov, first deputy chairman of the MB of NCVB. The anniversary of „Stroitel“ Newspaper had brought together, as well, the top-management of leading construction companies, partner and advertisers in the edition. It was attended by Dominik Hamers, Executive Director of „Geotechmin” OOD, Dr, Eng. Petko Nikolov, Executive Director of „Pathstroy-92” AD, managing directors of „Hydromat” OOD Eng. Anton Maslev and Eng. Kiril Maslev, Valery Hadjiiski, Executive Director of „Ustra holding” AD, Eng. Zhivko Nedev, Executive Director of „Hydrostroy” AD, Eng. Arch. Valentin Trashliev, Executive Director of „Euro Alliance Tunnels”, representatives of teams of „Glavbolgarstroy Holding”, „Geostroy”, „GP Group”, „Pipe System”, „Buildnix”, „Euromarket”, „Planex”, „Patinvestengineering”, „Jupiter 05” and many others. In celebration took part present and former edition employees and representatives of Chamber administration, media colleagues, as well as many friends of the team of newspaper. The hosts of the party on the occasion of newspaper’s jubilee were Eng. Plamen Pergelov, Chairman of the BD of „Stroitel Newspaper“ EAD, Eng. Lyubomir Kachamakov, member of the EB and of MB of BCC, also Chairman of the RO of BCC – Sofia, the procurator and editor-in-chief of „Stroitel“ Newspaper, Reneta Nikolova. The third member of the BD Eng. Blagoy Kozarev could not join the party because of an engagement. a leading professional edition and a partner of the construction sector. „I would like to thank our Principal – the Bulgarian Construction Chamber, the Chairman of the MB – Eng. Iliyan Terziev, the Management Board, the Regional representations, the construction companies, our advertisers, who always support all our initiatives and are constantly with us. And when we stay together, we are strong and we can achieve everything“, Eng. Pergelov stated and gave the floor to Eng. Iliyan Terziev. „I would like to thank for the enormous efforts you make and for everything the newspaper is doing for the Chamber. Keep up forward in the same spirit, do not stop developing yourselves and to look for new challenges. Happy holiday to you, I wish you to live long and to be healthy“, said Eng. Terziev.